Hydrangeas are among America’s most favorite flowers. Though we often see their round, cloud-like blossoms nestled in gardens all over the southern states, in today’s floral market, hydrangeas are becoming increasingly popular as cut-flower arrangements, especially when used in wedding work. The luxuriously fluffy form and supple texture of hydrangea blooms makes them a preferred choice in elegant floral arrangements. Caring for cut hydrangeas is relatively easy, as long as you remember a few simple guidelines. Hydrangeas love water, but their thick stems can make for poor water absorption. Cut the hydrangeas stem every 2-3 days (under water is best) to ensure that the bottom of the stem is not blocked by any naturally occurring substance of air. You may also try piercing a few tiny holes in the stem with a sewing needle – this will allow the flower to absorb water at a faster rate and keep the blooms hydrated. Remembering these tips can prolong the life of your hydrangeas and keep them blooming indoors a little longer. 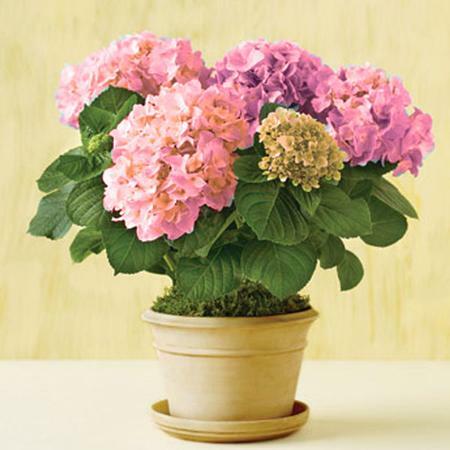 When shopping for your next hydrangea flower arrangement, consider Carithers Flowers Blooming Hydrangea. This beautiful blooming hydrangea plant can be enjoyed indoors and can also be transplanted, in southern zones, outdoors for years of enjoyment both in the garden and in your own floral arrangements. Carithers Flowers offers same-day flower delivery in Atlanta and across the United States. Follow Carithers Flowers Twitter and receive 10 % off your order using the special Twitter promo code.